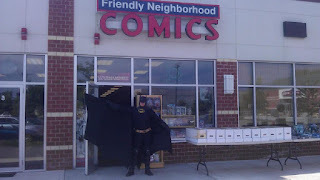 Meet Batman at Friendly Neighborhood Comics, Bellingham, MA on Saturday July 21st, from 10:00 am to 4:00pm! Have your picture taken with the Caped Crusader! Friendly Neighborhood Comics will host the Stall Brook Elementary School Summer Book Club on Tuesday nights at 7:00pm! We will be donating cool prizes to kids who enjoy reading all summer long!